It doesn't matter if you're in a 100 square-foot studio in Manhattan or a starter home in the suburbs-a small house can severely limit your choice of appliances. As average home sizes continue to shrink, you can bet that demand will only increase for washers, dryers, refrigerators, and dishwashers that can fit into cozy quarters. After extensive lab testing, we've rounded up the best compact appliances for an apartment or small house. Whether it's a little gadget, or a large tool, you'll be hard pressed to find product testers more thorough than the team over at Reviewed. So when they tell you what the best home appliances for small apartments are, you can rest assured they they've split every imaginable hair to determine the cream of the crop. 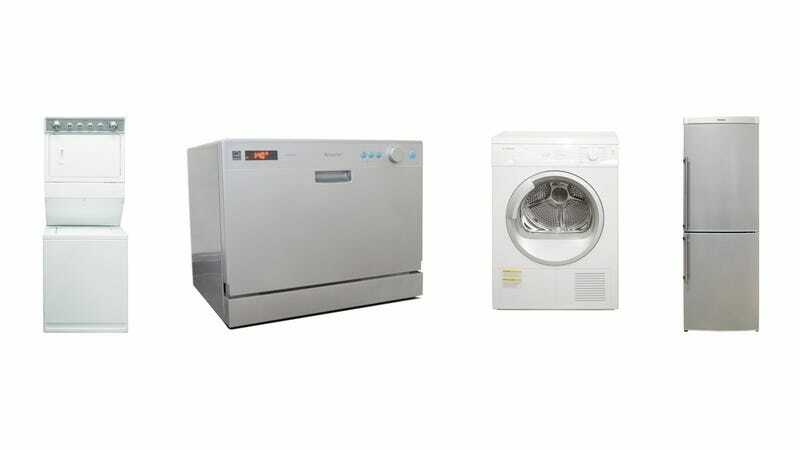 From Haier comes the portable HLP23E washing machine, which turns almost any room into a laundry room. Just wheel it up to a sink and connect a hose, and you've got a machine that can wash 1.5 cubic feet of laundry (a little less than half of what an average washer can do). On sale for around $250, it's extremely cheap to buy, though it's pretty expensive to run. We found that some cycles consume as many as 43 gallons of water. But if efficiency is less of a concern than convenience, then the HLP23E offers a decent combination of size, cost, and performance. From the land that brought us the Smart car, the 24-inch Bosch Axxis dryer is another testament to compact, European design. You'll need a 220-volt outlet, and the dry cycles take longer than on a full-sized machine (at least an hour, usually), but the baby Bosch is a good deal for a small space. The WTV76100US requires outside venting, but a similar condenser model, the WTE86300US, does not. At $1,400, the Maytag MET3800XW is a heck of a lot more expensive than a trip to the Laundromat, but it's perfect for city dwellers who have grown tired of hoarding quarters. It's a self-contained unit, designed for small spaces like closets and pantries, which makes it a solid option if the finish doesn't mesh well with your interior design. However, like the Haier, this machine is very inefficient. A standalone washer is probably a better value, but all-in-one convenience is tough to argue with. Refrigerators are the most important of all home appliances. They also tend to hog the most space, and because they're front-and-center in your kitchen, they also need to be attractive. This poses a unique challenge when it comes to choosing a refrigerator for a small apartment, as many compact fridges look more appropriate in a college dorm. With that in mind, the Blomberg BRFB1040SL offers the best balance of those demands. With a width of only 23.44 inches, it can fit snugly into a narrow cabinet space, and the silver exterior will work well in modern and traditional kitchens alike. What it lacks in capacity it makes up for in temperature performance, which was controlled and consistent during our tests. Requiring only an electrical outlet and a nearby sink, the Edgestar DWP61ES is an ideal dishwasher for a small kitchen. It performs very well for its size and price (a mere $260 on sale), and you won't need a plumber to install it. It's extremely efficient, too, with a yearly water and energy cost of only $18.37. Its oh-so-faux stainless exterior is kind of silly, and the capacity is tight-we could only fit four place settings, which is average for a compact washer but lower than the eight to ten place settings that average-sized machines can accommodate. But on the whole, this is a great addition to cozy kitchens. Head to Reviewed.com for in-depth reviews of home appliances, TVs, digital cameras and more. Reviewed.com is a division of USA Today.